Now, you might think this would be stellar news for Conor but, ruh-roh, PROBLEM. It’s no secret that Daly has his eyes set on Formula One, which means the next logical step for him is Europe’s GP3 Series. Did Conor already have a GP3 deal done when the announcement came? Was he set to do some FILS races with a team other than the one associated with Clauson’s scholarship? Who knows... since the above tweet, Conor’s been pretty quiet on the subject, so we’ll have to see how this one plays out. Regardless, this is one wickedly funny episode in the life of a race car driver. 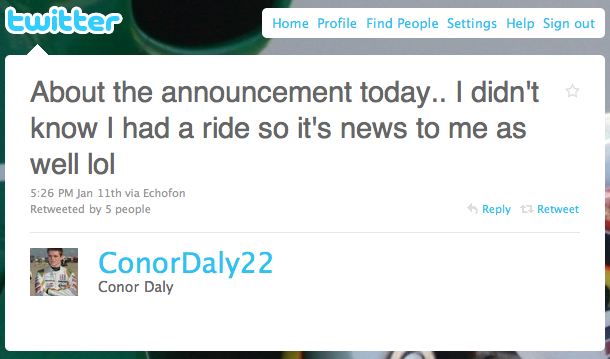 Yeah, Conor was pretty surprised about that announcement. I hunted him down right afterwards, and there were definitely some wires crossed somewhere.